Kim and Tom Beckham met in Colorado. Kim’s son from a prior marriage introduced them. They married and spent 20+ years in Colorado and then moved to Texas in 2014. They will be celebrating their 26th wedding anniversary this coming July. Kim and Tom found their love and passion in Christ, their marriage, and in serving together. This month as we celebrate Love we encourage you to find your passion just like they did. Stanley’s story begins as a boy living in Washington State with his parents. When his father accepted a pastoral position at a local church, Stanley and his family moved to Texas. Stanley has been divorced once and has a 16-year-old daughter. 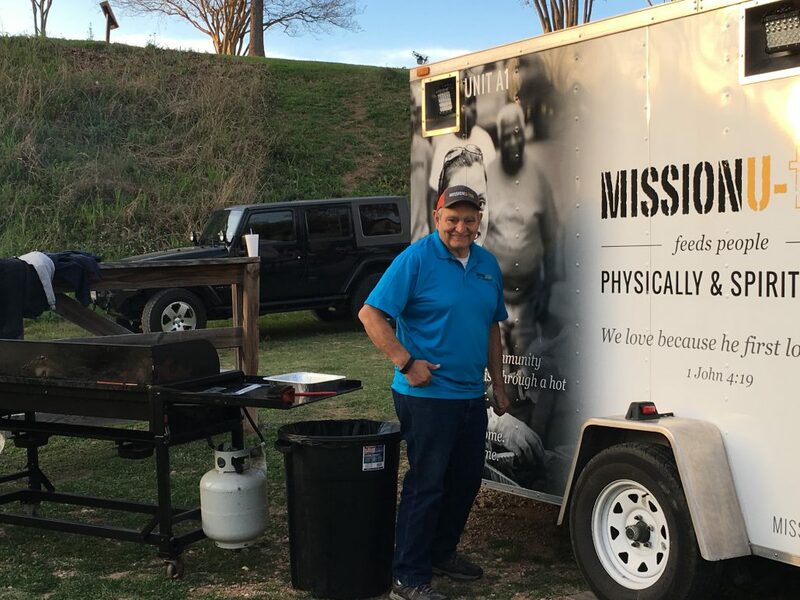 Stanley learned about Feed the Need Missions seven years ago when he noticed signs being held up by volunteers close to the Lumberyard in downtown Bastrop. At this time, Stanley was out of work, struggling to make ends meet and in need of a hot meal. 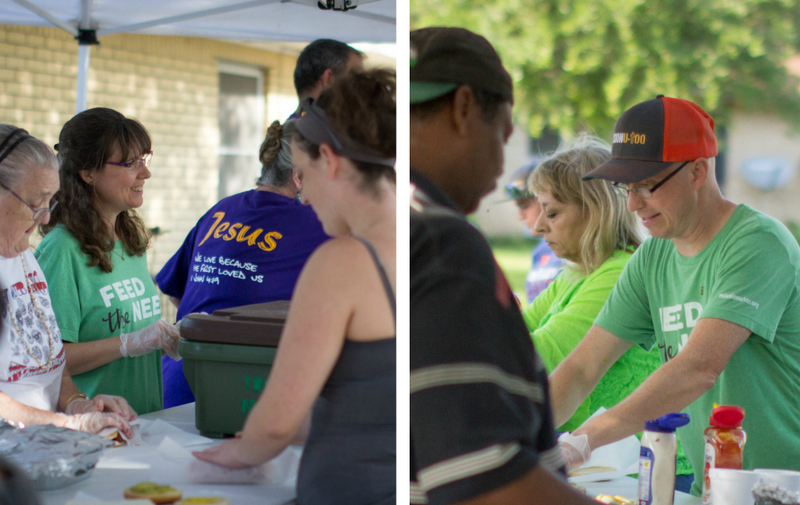 Three years after his first meal with Feed the Need Missions, Stanley began to volunteer serving meals with us to bless others. Often times you’ll find Stanley working behind the grills preparing the food to proudly serve to his Feed the Need community. Stanley will then take his food home to enjoy a hot meal with his girlfriend Janice and their dogs. We at Feed the Need Missions are very thankful for Stanley and others like him that give of their time and talent to help keep Feed the Need Missions growing strong. Lynn Martin and her husband Mike Martin have been married for 49 years. They were both born in Houston and spent the majority of their years there. They moved to Bastrop four years ago following God’s will. Lynn is a retired school teacher and has been teaching the Bible to children for many years. Lynn has been serving with Feed the Need Missions for four years and helps lead the line to serve food. Al was born in a little town of south Texas where he was raised as a migrant worker. He moved to Bastrop, Texas at the age of 13 and graduated from Bastrop High School. He joined the Air Force right out of high school and served our country. When he completed his time he moved back to the area and married his wife, Debbie. Al retired from the Travis County police force after 22 years, and 2 1/2 years with the State of Texas. Al heard about Mission U-Too from a friend who asked him to come and serve with him. It’s now been 2 years since Al has been serving. He went to the Bastrop North site and helped out with serving on the line and saw a really important need to reach out to folks. He said, “I had no idea what ‘Mission Youtube’ was or did. I fell in love with the needs to serve the community I was raised in.” For a while until Al became familiar with Mission U-Too’s name, he would call the ministry ‘Mission Youtube,’ as some still do. Al is currently serving at two sites. He’s a Site Coordinator at our Stony Point location and is currently filling in at our Bastrop North site. Al served our country well, and is now serving his community well. Al was a bit optimistic about serving at the Stony Point site, but, unfortunately, it wasn’t as easy since he knew many of those who he serves in the capacity of a police officer. But because of the people’s change of heart in Stony Point, they are now building a trust with Al. “Mission U-Too has made me understand and realize how blessed I am. It has allowed me to share what little I have with a group of individuals that genuinely care about the community of Bastrop and Stony Point and to see the need to spread the gospel of Jesus Christ, our Savior.” Al is continuing to learn what it means to spread the gospel and carrying out the Great Commission. Al share’s John 3:16 with those he serves “For God so loved the world, that he gave his only begotten Son, that whosoever believeth in him should not perish, but have everlasting life.” We should never stop understanding that God gave His only begotten Son so we may have everlasting life. We only give of our time for Mission U-Too…He gave His Son. School is out and summer has officially begun! Summer is an excellent time to serve with Mission U-Too, and we’d love to have you and your family join us at one of our site locations. Simply swing on by and hop on the line to serve with us. We set up an hour before each feeding and need help tearing down afterwards. All ages are welcome to volunteer, however, you must stay with your children at all times. Ed Burns family moved to the Bastrop area in October of 2015. Their first contact with Mission U-Too was when the youth from their church did an outreach at the Linden street location (Bastrop North) which coincided with a Mission U-Too service. About 4 months later, Jonah Beyer, the Mission U-Too President, came and shared at Ed’s church the vision and how Mission U-Too works. “During that 4 months, I had been spending time considering where my outreach was – and I felt that Mission U-Too was what I needed to get out of my comfortable surroundings and make a difference,” Ed said. He’s been serving with Mission U-Too for a about a year now. Along the way, his family started joining him. Come be a part of Mission U-Too and make a difference, not just in the community but for you personally. “Through Christ inside of each one of us, we can reach out and touch others, no matter how different they are from us. He can make a connection even though we are inadequate to do that ourselves,” Ed mentioned. Larry White has been a resident of Bastrop since 2001. In Bastrop, Larry served on committees at churches and had gone on short term mission trips. Struggling with his walk in Christ he was searching for more. Not long after he came, he started serving with Mission U-Too during the 2011 fires. Shortly after that he had a massive heart attack. During his recovery Mission U-Too moved locations to Primera Baptist Church. Today Larry is the Site Coordinator for this location. Brandon Phifer has been leading the Justin site since 2016, but has been a part of Mission U-Too almost since it’s beginning. 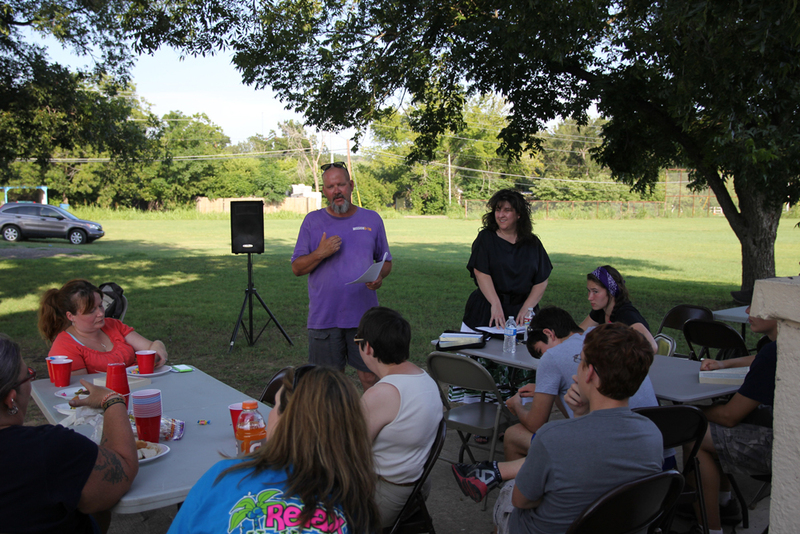 Check out his story to learn about his heart and vision for Mission U-Too in the Denton area. Years ago my closest friends started serving burgers and hot dogs in Bastrop, TX under the name Mission U-Too. When they originally started I participated at only a small level, but I was so grateful for their heart’s desire to make much of Jesus. I helped when I could, but mostly observed from a distance. The consistency of meeting weekly prepared them in ways they could not have expected. It was not long after they started that a fire devastated the area and destroyed hundreds of homes, which included at least 20 families from my home church. The work they did, that I had the joy of participating in, to care for the displaced families, first responders, and anyone else in need was tremendous and the city began to recognize their faithful and compassionate hearts. I moved away from the area a couple years later, but Mission U-Too continued to grow and I kept in close contact with my friends. They started multiple sites and made disaster relief an important function of what they do. Although I didn’t live nearby any of the locations to serve regularly, I was able to take my son and join them in Moore, OK after a tornado wrecked the lives of so many people. This trip only served to increase my ever growing desire to be part of this ministry. While I had aspirations to start a site in the North Texas area, I had very young children and was at the beginning of a new career. I simply felt the timing was not right. A couple years passed and Mission U-Too was still on my mind. I thought about the importance of leading my kids into a mission-minded lifestyle. I view my career as a mission field where I can seek to point people to Jesus, but my kids don’t get to see that. My wife and I became more and more convinced that we MUST get them involved in mission so they don’t grow up viewing the Christian life as something you do only on Sunday and Wednesday. We considered many nonprofits, but with a baby, a toddler, and a young boy, most of these seemed a bit impractical. My wife and I continued to pray for wisdom about how our whole family could be on mission together. I found myself specifically being called to Mission U-Too, but asked God to solidify that I was hearing him correctly by putting it on my wife’s heart as well. My wife already has a great desire to serve the Lord and longed to get the kids on mission too, but if Mission U-Too was the route we should take then I wanted her to hear from God, without my influence, so we could be on the same page. A short time later my wife approached me and said, “Let’s start a Mission U-Too!” That green light was all I needed and I began to plan and organize and prepare. We immediately began praying that God would stir people’s hearts to want to be involved. There is no question in my mind that Mission U-Too is a good thing to do, but I wanted God to call people to it in ways I could not possibly get the credit for. Over the next ten months God began to bring things together. My wife suggested a location that she felt was great, a park in the center of town. The city manager was excited about the idea and granted approval. I decided to put together a six week study to lead at my church that would encourage people to a missional lifestyle. I did not push Mission U-Too in this class, but offered it as an outlet to put to practice what we had been studying if they felt God calling them to it. I had lunch with many people and presented the vision of Mission U-too to my church life group. After all of this, a training was put together and 20 people showed up to a Friday night and Saturday training session! God was answering our prayer of putting the ministry on people’s hearts and calling them to be involved! We launched our site in November 2016 and it has been a huge blessing. My children love serving and will often leave the playground to come ask how they can help. One of my boys really doesn’t understand why we cannot do it every single day and the other boy has shed tears when he can’t make it. The joy seen in the eyes of the volunteers is so exciting because just as much as I value feeding those in need, I have a great desire to see the Church, the body of Christ, on mission in the communities God has placed us in. As Christians we must show the love of Christ in words AND actions. We have faced some cold nights and it gets dark while we serve, but there is always a family that comes that really benefits and the smiles on the faces of volunteers never seem to fade. We serve an awesome God who is already doing wonderful things in Justin, TX…in my family, in my Christian friends, and in the community. God is so incredibly good! Hannah is a cheerful 14-year-old who has been serving with Mission U-Too at various locations since 2012. She heard about Mission U-Too from her mom, Christine, who had first heard about the ministry at a local community group. She has been serving with her family ever since. A story about the tornado she remembers is hearing about two best friends who walked into the local high school together to get away from the tornado had died. The tornado destroyed half of the school. Being a high schooler herself she can’t imagine the devastation of losing her best friend. Jane and Mike first started serving with Mission U-Too in November 2015. We first met them a month earlier when they stopped to get some food from our disaster relief team as they were nervously waiting out the Hidden Pines Fires in Smithville, TX where they lived. Mike and I began serving with Mission U-Too November 2015. It was our first Sunday evening serving at the Bastrop North location that I noticed a young woman moving down the service line receiving her food and condiments. She maintained no eye contact whatsoever and in fact, had tears rolling down her face, staring downward as if she wished to remain invisible. I watched as she progressed to the end of the line and took her food to sit alone, with her red plastic cup. I was moved by her obvious sadness and was very uncomfortable that she sat alone, head lowered. I broke away from the line and approached her and in a futile reflective statement I had learned from years of psychotherapy training, I recall saying, “I can see that you’re sad.” I asked her if I could pray with her and she nodded. Regarding prayer as something intimate and private, I had never done anything like this before, which speaks to God’s stretching us beyond our felt comfort zone to empower us in anything that may be part of His plan. Disheveled, a bone thin body worn from years of addiction and domestic violence, wearing flannel pajamas, her name was Paula. She revealed she was “dying”, she couldn’t stop drinking, telling of her body failing and succumbing to advanced alcoholism, and held up her cup in almost a question of ‘what are you going to do?’ as she told me it contained her vodka drink. I listened as she talked and eventually we were joined by two other Mission U-Too ladies who prayed with us and accompanied us across the street where Paula resided to assist her, at her request, in pouring out her bottles of alcohol. She knew drinking was killing her and agreed to allow Mike and me to drive her to an AA meeting that evening. The meeting room was darkened by the time we arrived, so we took her with us to an ice cream shop where other Mission U-Too folks had gathered and once again she could feel acceptance and support from our group. 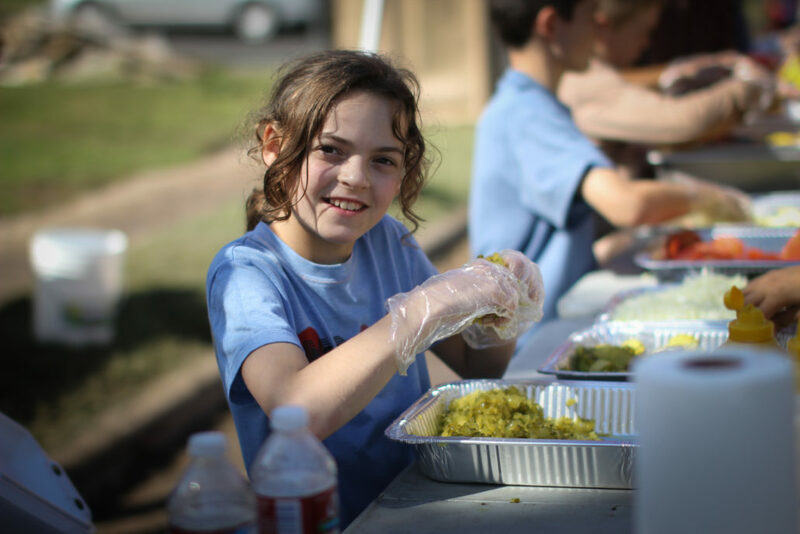 Weeks later our hearts smiled and our awe of God’s gracious intervention magnified as we watched Paula eventually come back across the street to step into the Mission U-Too service line to help prepare and serve meals for others. She grew in spirit and health in her recovery and was named as a line chief of the serving line, which she manages now with confidence and grace. As Mike and I experienced the calling to serve Mission U-Too after their ministering to us in a time of emotional distress, so Paula had come to serve the very ones among whom she had so many months ago been one of.